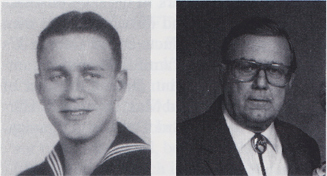 William Emmett Kneiple, Lieutenant Commander, born Oct. 27, 1920, Norfolk, VA, and enlisted in the USN July 6, 1938. In November 1938, he was assigned to the USS West Virginia where he served until 1943. During the attack on Pearl Harbor, he was the JL talker for Capt. M.S. Benion. After the captain was killed (when hit by a piece of shrapnel from the Tennessee), Kneipe was sent below to close the flooding hatches. He was the last man through the hatch. After abandon ship was sounded and after getting to Ford Island, he stayed with the ship until she was raised and taken to Bremerton, WA. Later he served on the USS Diphda and the USS Leyte. During his career, he acquired all the usual medals. He retired from CNO in Washington in 1959. Later he was employed by Philco Ford Corp. until retiring in 1981. He and his wife, Thelma, reside in Sun Lakes, AZ. They have four children and one granddaughter.